Home Indo-Pak News India Using Israel’s “Palestine Strategy” To Crush Rebellion in Kashmir? India and Israel share robust defence relations and many of Israeli strategies used in Palestine are being applied in the Kashmir valley. The J&K Police have started to disguise themselves as stone-pelters to nab those leading and organizing the mass agitation. The strategy of the Israeli security forces has been quite successful in Palestine and the Indian forces have started to replicate that in the volatile Kashmir region. The local custom of pelting stones at the security forces after Friday prayers at Srinagar’s Jama Masjid was disturbed this week, when policemen, pretended to be as stone-pelters, nabbed two men spearheading a mob of almost a hundred people in downtown Srinagar. As per the analysis of EurAsian Times, the mob was taken by surprise when they saw two stone-pelters who were leading the pelting, being grabbed by a policeman with a gun (that they claim was a toy gun) while covertly placed in the crowd. A few minutes later, policemen took away the duo to the police station. Puzzled with what had happened, the crowd separated, and the protest ended shortly than usual. 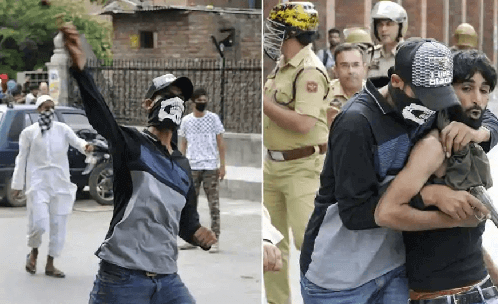 The old strategy in Kashmir devised by the security forces to arrest the stone-pelters is where a policeman embeds himself in the crowd in civilian dress, acts as a part of it and then nabs those leading the agitation. The J&K police had used a similar technique in 2010 at the same place. But this time, the youngsters were caught unexpectedly as they saw the policemen displaying guns. “This is an old strategy by policemen but this time what shocked the stone-pelters the most was the gun wielded by the policemen. However, some close observers of Kashmir’s politics believe that such a strategy can further increase the gap between civilians and security forces and can boomerang at any time. “It is not that for the first time this has happened. They have been doing this for the last two years but for the very first time, they had a gun in their hand. So, the question is tomorrow, how would one find out whether the one pelting stone is an actual stone-pelter or a policeman? The progress has also extracted multiple viewpoints from the people in the region, most of whom denounced the “strategy of deception”. “They have been trying this for last two years and were not successful, but now there is a new element of a gun being brought in it. This will be very detrimental for Kashmir’s situation. The public sentiment is already tense and now you are sending security personnel who are disguised as stone-pelters. So, there can be a counter-reaction to that, like what happened in South Kashmir when security forces picked up family members of militants. A research scholar had a different opinion and drew a resemblance with the strategy followed by Israel. He believed this to be an outcome of the engagement between India and Israel who are exchanging defence ideas. “The security forces are copying what is already done elsewhere like in Israel. This is infiltration by deception. This is a standard police technique used across the world. It is done by isolating protesters and arresting them. This looks like the result of the military exchange between India and Israel,” he said.